May 24: The Bilderberg Group will bring the final surrender of me and prepare their end document at their Copenhagen meeting before dissolving. I am still waving goodbye to the old system of my mother and on my way to the system of my father – passing the narrow canal from the Old to the New World. It is the birth of my child that darkness is now trying to block access to, and this is the meaning of my continuous work/exercise, to bring this. All we are waiting for is to make you our new engine for us – all layers of life – to be placed on, and this goes via exercise. My mother, thus the world, has been completely without energy for a week, which is because I have left the world and am now outside, and I decided to bring more of my energy to the world having to balance between making the world survive and being strong enough to continue exercising, which is what will open the Source to me. When I “exceptionally was allowed to continue” my journey/work, this came from the Universal Council, which was about avoiding the end of the world because I continued working. World leaders of the Bilderberg group, which is connected to this Universal Council, are meeting in Copenhagen May 29 to June 1, 2014, where they will talk about status of the world and me/us. The fall of the entire system of darkness (because of sins/darkness of man) includes the fall of this house and its members of world leaders that took the decisions on how to bring darkness of man to me via my sister, mother, Karen and other family, friends and the system self working against me, which really should have led to the end of the world. They now come to my homeland not to destroy but to celebrate me because they really have warm feelings and not the opposite about me. We have hidden the judgment from some of these members, who still fear the end of the world, and that is because they live lives in sins with the result that they also receive wrong information from us, and it is first with my coming here dissolving this group too that they will know about this. 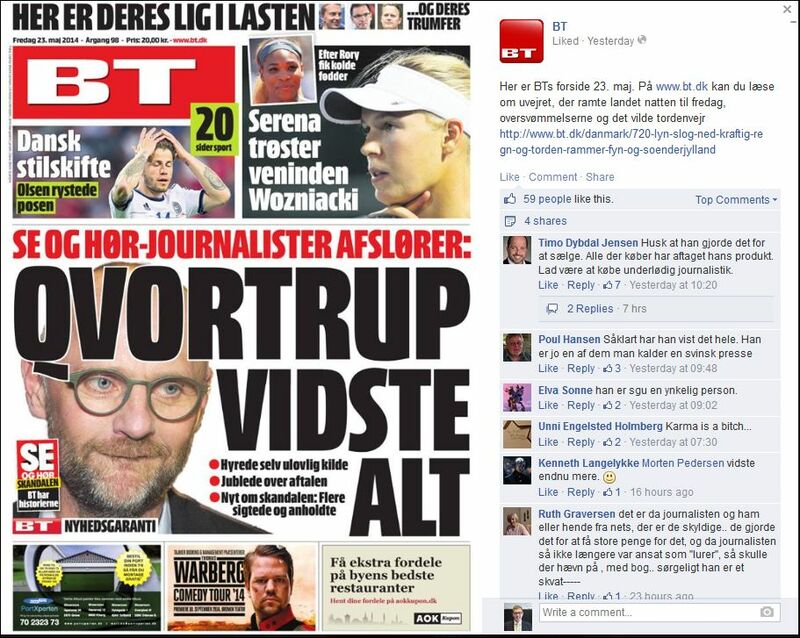 It is a condition for the Parliament, the Conservative Party and Bilderberg – and the media too symbolised by the arrest/fall of the Devil, Henrik Qvottrup, the former leader of the gossip magazine “Se & Hør” (they have used illegal methods to receive information about celebrities via credit card bills) – to be revealed/dissolved to open up for everything, and this is happening now. The Bilderberg group will prepare the end document about my arrival and their role on their Copenhagen meeting because they know that I am reaching the Source, where after we will “polish the lacquer”. This is about the final surrender of me as the last that Earth will decide, and yes, the last part of the Source as a hidden part of creation that man and the Universal Council controlled after we left man with the killing of Jesus, which they will now release. When man will discover the content of the dark New World Order prepared by these leaders, they will feel MUCH cheated/disappointed, but look at yourself, we merely brought you your own darkness/sins (via the Universal Rule of the Source returning to man what man brings). Nothing has happened to the Greenland whale, i.e. the Source, only yourself, and I am told that I had to give up the fight to make everything perfect (of creation of my mother, which is now replaced with “new components” of my father when returning to the Source), which is because I could not bring enough energy for this, and this is now coming from my father instead making everything “perfect” inside the Source as desired. I dreamt about invincible Russian invasion forces being sent in, but still I knock out incredible strong soldier. Later I am participating in a competition together with Henning W. and others about who is best to prepare food on a beach, and I start by frying bacon, and this is about creating life while suffering and using bacon, i.e. the Source. I slept better and felt better again this morning, which is ”more energy” even though I still feel tired, but this time it should be strong enough to last all day including spinning at the end of the afternoon, and yes, today it is 25-27 degrees here, which is very rare in May, but let us say that it is because the sun is shining …. Here is also a completely new lead guitar (for new creation). I was told “thank you for coffee”, and was then shown Bettina’s Søren, who still “cannot” understand my direct language, which he finds is both offensive and degrading, and no, he still doesn’t like to be included in my scripts. My neighbour Preben asked for my help to go to his late mother’s apartment in Copenhagen and bring a sofa from the 5th floor “if you don’t get a heart attack” as he said (! ), no, I don’t, and he will come back when he has arranged a car, and he even offered me money, 300-400 DKK to help him, to which I could only say that “I don’t want money to be between us”, which is how I feel about friends helping each other, but it is of course fine to share a bottle of wine as he offered, and yes, we are becoming “good friends” here. I was shown myself on the ferry from Helsingør to Helsingborg waving goodbye to the old system of my mother with a blue handkerchief, and on my way to the system of my father. 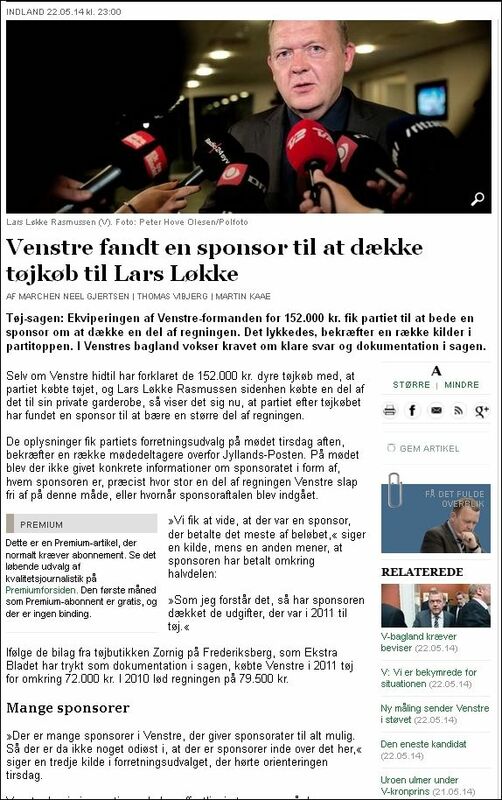 I was told that Lars Løkke knows about how I was given sexual torments/temptations in my life via secret files on me, and I wonder how you could be so careless with public/party funds then, Lars, not being able to control yourself (? ), and yes, this has to be a part of you that you could not resist because I don’t believe that it is not a planned/”ordered” act. When I “exceptionally was allowed to continue” my journey/work, this came from the Universal Council, where Lars is/was also a member. And this was about avoiding the end of the world because I continued working. I felt the Danish Finance Minister Bjarne Corydon, who is part of the Bilderberg group, and I was told that this is what they are going to speak about at the Bilderberg meeting in Copenhagen from May 29 to June 1, 2014, and that is about the world, me, us and where are we (? ), and the fall of the entire system of darkness (because of darkness of man) includes the fall of this house and its members of world leaders, which is where the decisions to let my mother work against me – make it “impossible” for her to understand me, like Elijah and many else – was taken, and again ONLY because of darkness, i.e. sins, wrong behaviour work and communication, of man. And they don’t come to Copenhagen to destroy you, right (? ), no they come to my homeland to celebrate me, and yes, maybe you would like to invite me for coffee, my ladies and gentlemen (? 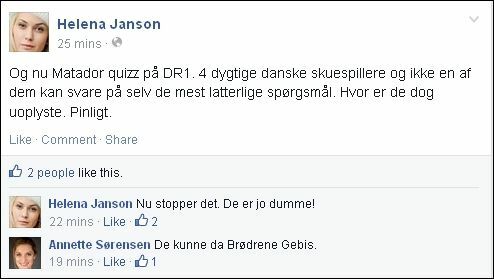 ), just call me (! ), and yes, George Michael and Blondie are included in this, which is really about “warm feelings”, which is the true feeling of these world leaders in relation to me and man, and NOT the opposite, so there you have it. Lack of faith of man required the Universe to create this dark NWO and bring “the end” with the underlying plan to save all, create our New World and return home to God. The Bilderberg Group wanted to control money and man via extermination/ enslavement and One World Government/currency/set of values. And Cyprus is one of the secret places, they have kept for years and met for years out of the limelight of the public? They also created your sister as “necessary evil” against you with the goal to bring the end of the world, and yes, everyone “knew” that this is what was coming because I “could not” go up against this incredible force of darkness of man that was sent out via my sister. We have hidden the judgment from some of these members, who still fear the end of the world, and that is because they live lives in sins with the result that they also receive wrong information from us, and it is first with your coming here dissolving this group too that they will know about this, and yes, Hilary Clinton and all the rest, and who are you really (? ), the ones that have been invited for this meeting (? ), and yes, we will see soon. So no one has known the full truth except from the Source. After writing this morning, I did what I had planned to do yesterday, which was first to vacuum clean and then wash the floors of my apartment, which really needed this, and this is part of becoming “perfect”, and no, I really STILL don’t have enough energy doing this work, which was incredible exhausting to do. Yes, it is a condition for the Parliament, the Conservative Party and Bilderberg – and media too – to be revealed/dissolved to open up for everything, and this is happening now. No, nothing has happened to the Greenland whale, i.e. the Source, only yourself maybe, and I am here told that I had to give up the fight to make everything perfect (of creation of my mother, which is now replaced with “new components” of my father when returning to the Source), which is because I could not bring enough energy for this, and this is now coming from my father instead making everything “perfect” inside the Source as desired. It was considered by the Universal Council to kill Obama – besides from my mother and others, which would have brought energy but also reduced the opportunity to create. They even considered killing Karen to see what would happen, and this is because their task was to keep the balance between doing “perfect” creation and creating energy for this. But you received most of all negative energy that was sent to you, which was used for creation. It is the birth of my child that darkness is now trying to block access to, and this is the meaning of my continuous work/exercise, to bring this. I went to the library to publish my script, and I was happy to meet Allan there again, and even happier for him not to be visible nervous, but to speak to me as we used to do, and when I told him about my visit to Sofiero Castle, he told me that this was the childhood home of the late Queen Ingrid, the mother of Queen Margrethe, and yes, she was a “very special lady” indeed. I was told about Per Sa. in Espergærde, whom I didn’t know very well except that we went with morning papers together and spoke well, and he is an example of a person that the Bilderberg group, i.e. secret network, influenced in relation to me, and yes, this goes back to around 1980. I received the lyrics “take me down, to the Paradise City – take me home” by Guns N’ Roses, and this was not least because of Allan sitting opposite of me as I was told. And it isn’t this that Flemmng has been brought in to help with (? ), and that is to bring down all of this system of darkness, and yes, he was kind of a monitor of our family as friend of Sanna and Hans, and he had wide authorities. I was still sitting above Allan, and I was given constant feelings of him being sent here and being an “actor”. Are they about to prepare the end document about my arrival and their role, “can we give it to him now” (feeling that this is what some members want to do) (? ), and this is also on the agenda of this Bilderberg meeting. They can also see that it is impossible for Karen not to come my way – and then it is about polishing the lacquer as some of us here say. 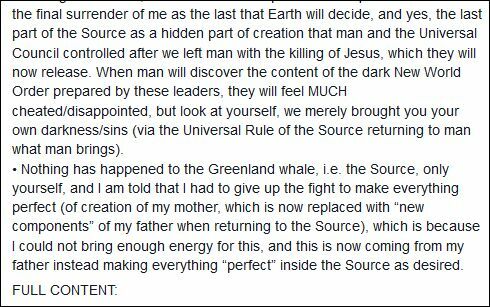 This is about the final surrender of me as the last that Earth will decide, and yes, the last part of the Source as a hidden part of creation that man and the Universal Council controlled after we left man with the killing of Jesus, which they will now release. Karen has not had the desire to kiss you before now, which is also because of the change of view of your mother in you. Obama offered to sacrifice his life to avoid the world from being blown to atoms, and he was not the only one doing this, but the most prominent. At 15.30 I was truly VERY TIRED and I thought that it would be impossible to do spinning later at 18.00, but it was partly because of heat today, and yes, I really still don’t have enough energy to last a full day including spinning, but this is what I try to make real if I can. It became somewhat better later, and I went to the spinning, and while spinning I was told that I have to become “perfect” myself, i.e. to lose weight, in order to come here, and I was told that we are going through the most concentrated darkness of all, which is absorbed by faith, my work and exercise. And I have felt this concentrated darkness in my throat the last couple of days as I did some months ago too – like a thin concentrated passage of something. The last 20 minutes was “impossible” to come through also today, but I did my best, and used 665 calories today, and it really requires that I can do at least 4-5 exercises per week, to become more enduring and then it will take 2-3 weeks before I can see weight loss on the weight, and that is even though I was given a feeling to my stomach today that I have started losing weight, yes, I can feel it and I feel that I am still doing this going through darkness, but I know that fat is transformed into muscles in the beginning, which therefore will NOT show as weight loss on the weight, and yes, these are the conditions for me to lose weight – first and foremost that I have energy to do it – and if these conditions are met, I should be able to see the first weight loss, and hereafter 1-3 kilos per week. 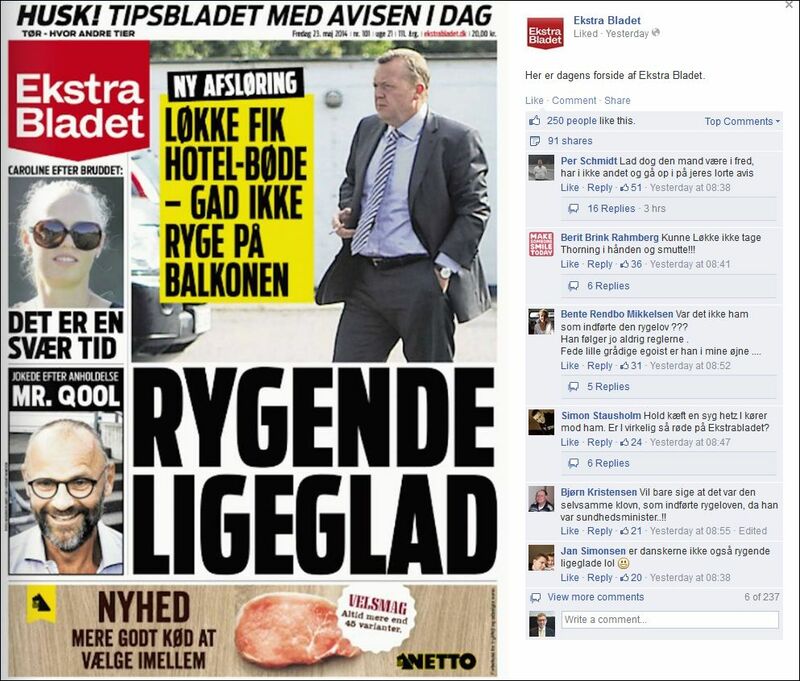 I felt my mother’s friend Käte, which is because I saw on Facebook that she will be meeting with some of the people of the Helsingør in pictures Facebook group, and yes, “Stig is not crazy” is what she will say, which is also to say that the news about me is still spreading. I am still following the World Championships in Ice Hockey, which today reached the Quarter Finals, which Sweden just passed winning closely over Belarus, and they will now face Russia in the Semi-finals, and I was told that Russia has shown terrifying strength in this tournament so far because of events of real life with incredible darkness being released from Russia, and is it so that Sweden – my “home land” – will be able to stop them (? ), and yes, we will see in a few days. I was told that Allan was to see that I am not crazy. I was shown the light of the spaceship of everything at Hittarp, Sweden, again at 21.14 this evening, and it continued giving a constant, but pulsating light for minutes, and a little later I was given the feeling of Benedikte Kiær, and I was told that she has seen the light too (after reading about it from me), and yes, she is living in a straight line from me to the sea approx. 300 metres away from me and can see it from her home or at least from the Beach Road. There are not so many of these anymore, and I was then given a striking sound to my balcony. I called my mother this afternoon receiving no answer, and I was getting a little nervous about the risk of her having negative feelings at me again, but at spinning I was told that she is simply having poor conscience because she hasn’t called Lis as agreed, and finally, this evening, she called, and she told me that she has had “no energy” all week, thus not calling Lis, which we have to postpone then as she said, and yes, it came me the chance to tell her that this is exactly how I have felt “the last five year” having had NO energy but still I have continued working my best, and no, no one still understands just how incredible tough this was to go through. After thorough surveys they, i.e. Bilderberg, knew that my mother and John had to be sacrificed first and me thereafter. So finding me – at the Source – brings energy for survival, which is just what we wanted to show with your mother having no energy. The more I have written and written about people, the more of these people have been invited into the secret network and told the truth about me. I still continue receiving some sneezes and hiccups. I dreamt about sailing with a scientist bringing an incredible variety of plants and a number of people including my mother and John, who serve good wines, but I would like even better quality, and they also serve fine strawberry mulled wine. Another expert on the boat recommends the scientist to bring the plant “Malaga”, which is missing. Something about camera and pictures that will be send out later, and biscuits are being thrown onto the boat from pretty far away. And this seems to be about “perfect” creation, which we could not create via my mother (using my energy), which will first come via my father, and is this to say that this will first come “later” (?) because the pictures of this, i.e. life, will first be send later. I am on the Town Square Hall in Copenhagen about to make a left turn in the traffic, and I am following Bettina, who however decides to break away not taking the turn because she claims to have pain in her knee, but I feel her knee and can tell that she really has not, and I make the turn then, and my mother is there too feeling nervous that I will not return. I also dreamt about having made an “incredible pension calculation system”, which I had written down the design of on MANY papers, and I remember and see some of the chapters, where I was almost desperate not sure about the design of the structure to make it work, which was “incredible difficult”, but I received help from an incredible skilled actuary who made his notes on my papers as replies showing me how to set it up, and I have now made the system, which Rikke H. is testing, Lennart (from Aon and Kim’s later company) has given his written comments on my papers giving the system a good review, and a banker, who feels like Mike Thorne from SAGA, is helping out too, and I see how Kim S. is now testing the first version of the system, which is now tomato soup, and he is very pleased that they system includes the option to include the transferral of all other pension schemes including “everything else” – the same principle for transferral of all other business assets is included as part of the system – and he invites all of us at the company to meet tomorrow morning to discuss the system. And yes, this is the system that I have dreamed about quite often, and it is a symbol of the creation of our New World, which includes “everything”, and I was told that this will become a bomb under the holiday system. I received Whitney Houston’s “I wanna dance with somebody” including the lyrics “I wanna dance with somebody, with somebody who loves me”, and “clock strikes upon the hour, and the sun begins to fade”, which is because it will be replaced with our new sun, and yes, the feeling of this song was dance = CELEBRATION. I continue receiving feelings of people of importance to me, which includes my father’s widow, Kirsten, still thinking about giving me “a memory of my father” – incredible that she doesn’t focus on and understand the big picture of me instead of this – and my old class friend Lone B. has come to me strongly too – as examples only. My first feeling when awakening was again that I am still too tired to exercise – but less tired than before – so every day is still a fight to defeat this. I received this email from John asking to lend money for me for his mother’s operation, and I am sorry that I could not, but I have an extra heating bill coming now, and a new electricity bill may also come now, and I did think about postponing the payments of these, but I could not make it go up in the end, so I told you no, John, and yes, you may wonder how my mother could afford to pay for her eye surgeries (? ), and yes, it is free here (paid via taxes), and no, I could not ask my mother for a loan for your mother, she would NEVER grant it as experience from the past shows. I kept on feeling Karen and was told that ”there is only you” for her. 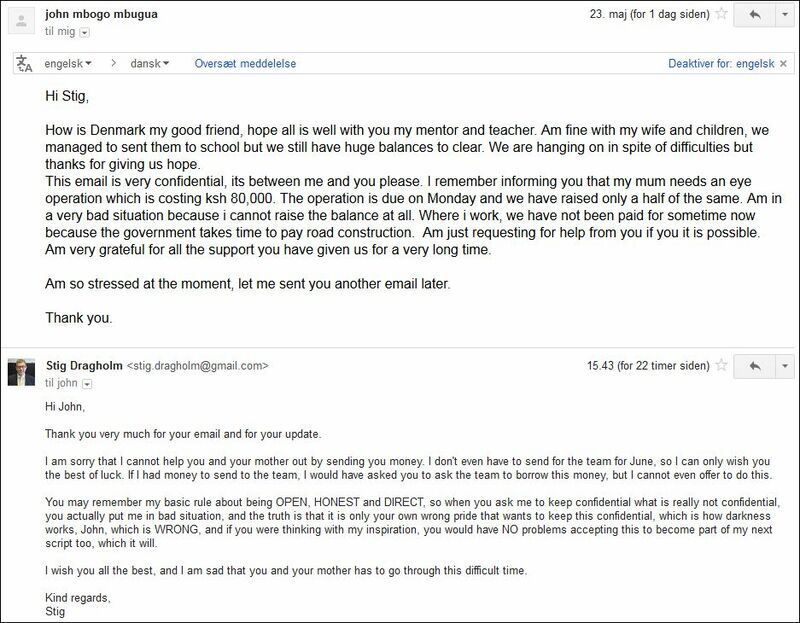 I felt Dean, the sound man of SAGA, and then Jim from SAGA, and yes it wasn’t priceless what you did sending this email to SAGA the other day, but “almost”. I was shown a light added to the Saturday Night Fever album, and this is the light that we are headed to, and I felt Barry Gibb and was told that it is still (the program installed in) him that is leading the way. Karen is thinking about the meaning of life, and then thinking of me and her as the Source. Do you feel cheated so much that the water is running (? ), and eehhh look at yourself, we merely brought you your own darkness, this is what the feeling of man will be about when all of the dark New World Order is revealed. 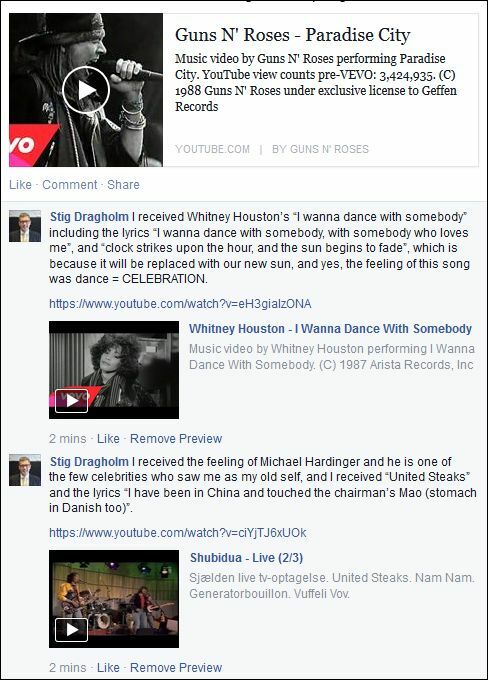 I received the feeling of Michael Hardinger and he is one of the few celebrities who saw me as my old self, and I received “United Steaks” and the lyrics “I have been in China and touched the chairman’s Mao (stomach in Danish too)”. I received more pain to my throat – the feeling of this concentrated, thin ray going through – which is part of the last creation coming from the Source to make everything perfect. I was given the feeling of Shu-bi-dua’s album “the 78th” and then I OF COURSE received “Brdr. Gebis” (“the Brothers Dentures”) from this album with Gebis in Danish sounding close to Bee Gees in English, and yes was on the height of the Brothers Gibb in 1978, and I received the lyrics “big strong men sounding as if they come from a boy choir of Bethlehem”, and yes, you may understand that Shu-bi-dua was indeed inspired back then, and I also remember loving this song back then when I was 12 years old, and what other band than Bee Gees can sound as closely to the Bee Gees sound (? ), and yes, you should read the lyrics and SMILE my friends :-). No, Lisbeth from the Commune hasn’t sent me the questionnaire that she promised, and is this because she is starting to receive cold feet about the plan of the dark system to transfer me to permanent disability pension? Some had expected to see my mother too (opened spiritually), but it wasn’t necessary because I did not lose it. 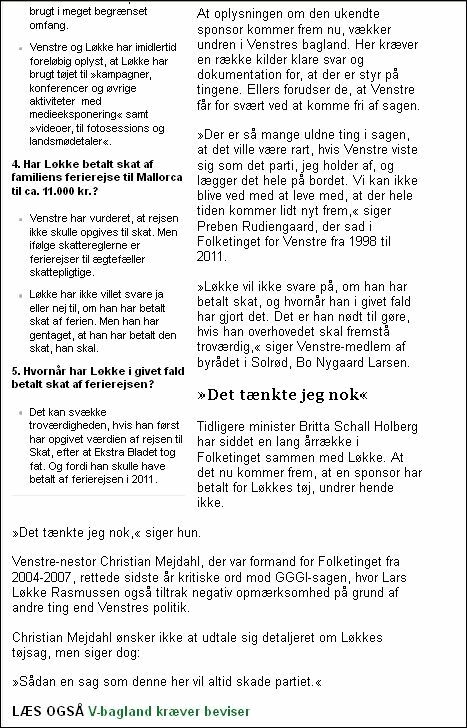 I was told that my sister is not proud to be portrayed as “brainwashed” in my scripts for example in relation to Poul Nyrup-Rasmussen, the previous Prime Minister now working with psychiatry. I really did not feel well today, I was again more tired and my eyes ran in water, but still I wanted to go to Fitness World, but there was no spinning today, and I decided then to go to try to run and use the cross trainer, but I discovered that my running shoes had shrunk and were completely wry (! ), which was because I used them in the tumble dryer recently when drying my washed duvets, and no, I had not expected this outcome, and this means that even though I cannot help John with money and cannot send money to LTO in June – because of an extra heating bill – I have to buy new running shoes when I receive my cash help the next time, and yes, the more exercise, the better it will be. All we are waiting for is to make you our new engine for us – all layers of life – to be placed on, and this goes via exercise, if I can. So it wasn’t you but man self via the Universal Council, who had to turn down the world if it couldn’t survive anymore, which was the mandate we gave them when leaving them, and yes, see you later when you cannot make it anymore was really the message. And this is what Jack & Co. – Armed Forces – have prepared via weather control etc. with “natural catastrophes” developing catastrophically. I was told about maize chicken that have never seen maize, but received GMO fodder to promote the breakdown of the world/life, and yes, LIFE DANGEROUS it is, and this also happens at Danish factories, let us just say that, and it is approved by Barosso, the President of the European Union, and yes, this “nice man” as I was watching in an interview by Uffe Elleman and Mogens LYKKEtoft. This is also what your energy has been used to fight against. I visited my mother and John again, and at dinner I was shown and told that we have all been inside my mother. My mother told me about my sister having shoulder pain, which may be because of a slipped disc. This is still about the giant work to put the engine on place. My mother still has no energy – as I have not had for years. We will be going from MINIMUM to MAXIMUM energy/force of the Source, which is minimum now that soon will become MAXIMUM when we turn on the Kraftwerk of our engine. I was told that the system cheated with the scanning results of me (in 2008) making me sick, which allowed them later to do a mental declaration on me, and from here the road was free to lock me up, but again, they didn’t realise the power of love between mother and son breaking their plans. I could see both ways which was my own and others point of view, but others could only (more or less) see their own and not my point of view, which in principal is the same when the Source could see the world but the world could not see the Source. We spoke about going to Tivoli in May to see a free classical concert (for people with annual member cards as my mother has), and my mother likes to go, and says that John does not (! ), but when asking John, he says that he would like to go too (! ), and I have now some times tried to convince her also to bring John even though one card only brings one person and a guest in for free, and yes, invite Sanna and Hans too as I said, they probably have a card too (? ), and we will see, and yes, this is also to “keep John with us” not locking him out. 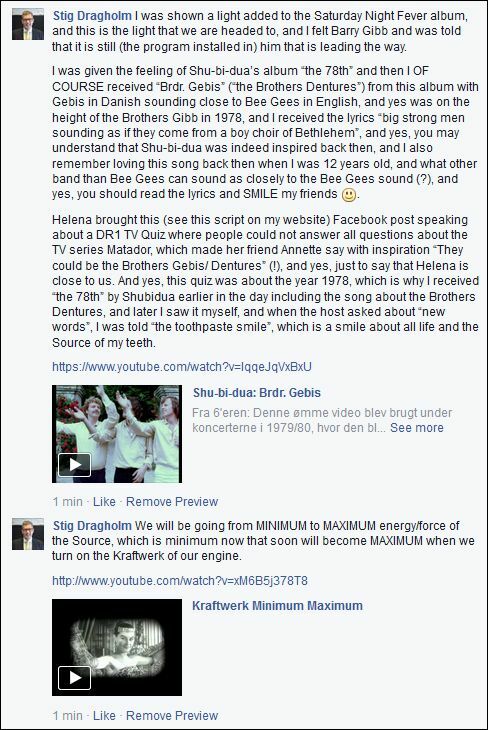 Helena brought this (see this script on my website) Facebook post speaking about a DR1 TV Quiz where people could not answer all questions about the TV series Matador, which made her friend Annette say with inspiration “They could be the Brothers Gebis/ Dentures” (! ), and yes, just to say that Helena is close to us. And yes, this quiz was about the year 1978, which is why I received “the 78th” by Shubidua earlier in the day including the song about the Brothers Dentures, and later I saw it myself, and when the host asked about “new words”, I was told “the toothpaste smile”, which is a smile about all life and the Source of my teeth. No, you really cannot put in your head into creation from outside (a part of me as the Source into creation) and make love to a woman inside of there, which is why I had only little love in my life as my old self. So those who wanted to enter me (the Source) creating their dark New World Order were the same people knowing that this would end the world, because darkness is not sustainable as life. I was shown myself as very small inside an Ortofon pick-up, which is reading a record, which is the Source reading life inside this cell, and this is where we are now. Does it mean that when my mother is out of energy that the world is out of energy (? ), and yes, this doesn’t make me decide to stop our work, because there is only one road, and that leads forward. And is this because you have left the world (?) – now being outside my mother – and what will we do then (? ), and yes, make sure that my mother/the world receives energy. I couldn’t resist bringing energy with me on the way out so when you now ask for energy to be brought to the world, it will be taken from you, and yes, if this is the only way to do it, do it (! ), and this is about finding the balance between making the world survive and for me to being able to exercise brining the opening of the Source, which should not be difficult, right (? ), and yes, we will see what this will mean. And I was told that the alternative, if I cannot do this, is to return to the world to carry out my old nightmare. Fuggi cannot remember what we disagreed about making him decide to stop seeing me in 2010/11, and I cannot either, and yes, a small and unimportant thing as I already wrote about back then. This is also connected to no one being able to apologise to me.